The Killing Fields – Trump Style! Bullies Kill … Unite Against Them! Amtrak Train Crash – America’s Broken Contract! Time For A REAL Change of Climate !!! From Prisoner of State to Head of State! Women leaders are not spared from the wrath of the State imposed imprisonment – my hero, Aung San Suu Kyi spent 15 years under house arrest in her country. Almost an accidental political operative – there by choice buy equally happenstance – this brave woman was both championed and at times reviled by her countryman. Courage a constant companion as she choose to be at risk and away from her family safely living abroad. Risking life and fortune not singular to males who decide to brave the “slings and arrows” of opposition to their causes. The difference I am often offended by is that the world ask how could a woman give up the security of a husband and children to put life and limb at risk for a bigger issue? Why indeed would anyone – man or woman is my retort. Seeing as those one is seeking to protect and elevate are far too frequently those determined to destroy a leader such as Aung San Suu Kyi. 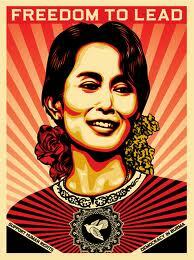 Many in her nation of Burma have been critical of this woman’s decisions – her every move, her loyalties and ideals questioned by her nemesis. Surely some criticism is legitimate but does not the singularly bravery and devotion of her elk deserve at least gracious consideration and respect despite an opposite view being held by others. To use the vernacular – this type of almost after thought of a mostly championed leader is REALLY a case of “you are damned if you do and damned if you don’t“. May I suggest – trust me I know personally this to be true – that is a lesson to be well learned by us all, for is not often the same persons we defend, those who turn their backs and even reproach those of us having been their protectors. Certainly worth remembering this thought and with that precedence in mind, choosing to forge ahead only if for the purest of reasons – no dependency on glory from others should motivate martyrdom as that will surely lead to REAL imprisonment of spirit and mind. I remember being uncharacteristically glued to the television screen while watching Nelson Mandela leave prison after 27 years in 1990 – great apologetic fanfare accompanied his release from captive South African apartheid. Amazing I thought – such grace and dignity. No, never would that would be my demeanor I instantly knew to be true – I could not display so much largess in the face of my lessors; those who had so degraded this great man, now at his side with deference was repugnant in my mind. And yet, Mandela’s sweet smile was tinged with a knowing that he had REALLY been the triumphalist in the world’s and G-d’s eye. Self satisfaction was my personal feeling that day – my parents even though not alive to see this great man’s freedom achieved, campaigned against and contributed toward defeating South Africa’s Apartheid system. I joined them and in fact protested outside the D.C. South African embassy more than once. Too many arguments to recall were in my past concerning the horrors and injustice that defined that country for far too many years … my late husband [widowed in 2001] David cringed as I was reproachful at a cocktail party for IBM executives as to why their firm was still dealing/having a presence in South Africa despite others not doing the same in order to help end apartheid. Not all leaders of nations once nor eventually imprisoned by the nations they have or go on to lead are as glorious a person as Nelson Mandela. Of course, that denotation is oft times REALLY “in the eye of the beholder” or some might say in the heart of ones syncopation group. Napoleon Bonaparte is just such a fellow … leader and some believed savior of France was defeated and imprisoned only to escape and reign again. Surely there are still those in France who think this diminutive leader a hero and others not so much … guess it REALLY does depend on which side of those barricades your ancestors were during that French revolution. Still one must acknowledge the strength and shear will a man like this must have had in order to persevere against the State operation that took him captive and imprisoned him. The analysis begs us to understand why some can and others can not overcome such extreme circumstances. I have traveled to France more than once and admit to having at times fallen victim to the romanticism of Bonaparte – many places remain to honor this general and evidence of his good deeds can not be denied in that nation. My personal dictate is that REAL faith, REAL family, friends and devoted colleagues … an intrinsic knowing of ones worth is paramount to REAL freedom and these leaders I have referenced here, as well as many others, must have had that sense of destiny that only REAL self awareness provides. I promise that all the REAL and very detailed facts as to my own such journey toward what my dear husband says brands me Tereza Triumphant™ will be shared in my memoir, Heiress Mommy … A Modern Super Woman Life!. As I have insisted to my co-writer, publisher and publicist – this book will not only tell my REAL story but must be a teaching tale for other REALLY good people. No matter if one is Head of State or CEO or other leadership role and no matter whether at home or in a public position – even those choosing a path unorthodox – none should be imprisoned by others evil misconceptions nor selfish motives and definitely never on account of another’s feelings of inadequacy as they will want to lessen you in order to feel better about themselves.. All who lead in whatever capacity must not fall victim to The Miscreants™ !!! whoah this blog is wonderful i like reading your posts. Keep up the good work!